LSU: Tony Benford has done an admirable job of filling the void left by the suspension of head coach Will Wade, and getting off the schneid in the NCAA Tournament’s first two rounds was huge for a team that has shown it can athletically hang with any team. The pressure is off, too, so nothing should be too surprising from this point forward. Still, things get a lot tougher now, and the chances of Benford beating Tom Izzo and (likely) Mike Krzyzewski in one March weekend are pretty slim. Thus, we think there is only a 10% chance the Tigers reach Minneapolis. Tennessee: If NCAA Tournament games were 20 minutes long, we would be as high on the Volunteers as any team left in the field. But they’re not, and Tennessee’s second half meltdown against Iowa left a bad taste in our mouths about Rick Barnes‘ club. On the other hand, March Madness is all about surviving and advancing, and it would be a mistake to undersell a team that is currently 31-5 and has spent the entire season in the top 10. What appears to be a very even match-up with Purdue obviously could go either way, but if Virginia holds serve, the incredibly balanced Cavaliers would present a significant roadblock for Tennessee. Based upon that, we think the Volunteers have a 25% chance of making it out of the South Region this weekend. Having four SEC teams make the Sweet Sixteen is a dramatic improvement over the not-too-distant days gone by in which the league regularly failed to even get that many bids into the field. But if the SEC wants to be taken seriously as one of the two or three best basketball leagues in college basketball, a successful weekend would go a long way towards making that case. 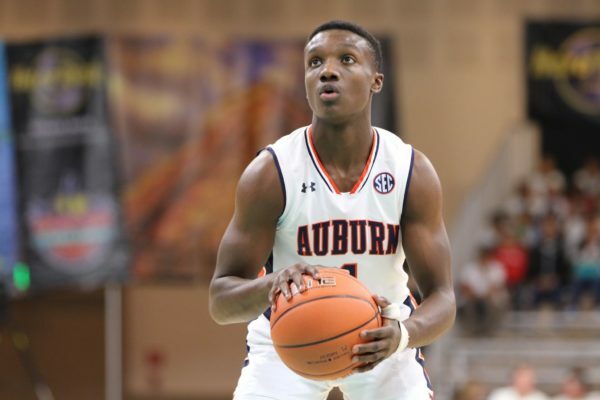 This entry was posted on Wednesday, March 27th, 2019 at 2:15 pm by David Changas	and is filed under 2019 ncaa tournament, feature, microsites, sec. Tagged: auburn tigers, kentucky wildcats, lsu tigers, pj washington, tennessee volunteers, Tony Benford. You can follow any responses to this entry through the RSS 2.0 feed. You can leave a response, or trackback from your own site.